State House, Freetown, Thursday 17 January 2019 – The newly designated Nuncio Archbishop to Sierra Leone, Dagobertio Campos Salas, has today presented his Letters of Credence, a formal diplomatic letter of appointment, to His Excellency President Julius Maada Bio during a ceremony held at State House. 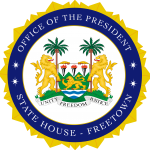 Salas said that it was an honour to present his letters to President Bio, which accredited him to serve as Nuncio to the Government of Sierra Leone. He said the longstanding diplomatic relationship between Sierra Leone and the Holy See was a sign of the mutual desire to work for the advancement of the human person and the society. He mentioned that the bilateral relations were an expression of the collaboration which had at heart the integral spiritual and material good of all, saying that the mission of every diplomacy and especially that of the See was to strive for peace and the common good of humanity. “The Catholic Church is committed to fostering the dignity of the human person, not in the abstract, but in the concrete human realities of everyday life. In this respect, there are many areas of necessary collaboration between the Church and the State. The Catholic Church in Sierra Leone continues to contribute actively to the promotion of a just and peaceful society in this beloved country. “The Catholic Church in Sierra Leone is also committed to strengthening the existing good relationship with other Christian Churches and other religions, and so to foster religious freedom and peace in the country. I wish to thank Your Excellency for accepting my Letters of Credence and present to you and the people of Sierra Leone my best wishes and prayers,” he said. In his response, President Bio said he was thankful for the cordial greetings, prayers and blessings shared by the new Nuncio on behalf His Holiness, Pope Francis, and accepted his sentiments of goodwill for the country. He said the relationship between Sierra Leone and the Catholic Church faith had spanned over 600 years ever since the arrival of Portuguese missionaries of the “Order of Christ”. He noted that he was grateful for the consistent and generous support of the Catholic Church during times of pestilence, humanitarian disasters, war, and in restoring peace and reconciliation, adding that the humanitarian mission of the Catholic Church, in providing quality healthcare and education and in supporting the displaced and the poor, had been invaluable to Sierra Leone. “We also acknowledge and support the Holy See’s consistent advocacy for peace, defending the dignity of the human person and working for the integral development of human society. The Catholic faith and its imprint on Sierra Leone and changing Sierra Leonean lives for the better has grown immensely and irreversibly. “My government’s investment in human capital development, social justice by providing access and opportunity to all, fighting corruption, and fostering national cohesion, align with the Holy See’s broader mission in Sierra Leone and in the world. We look forward to a future of working cooperatively on deepening our democracy, fostering the dignity of the human person by escalating investments in human capital development, and promoting national as well as world peace and security,” he said.